date’… It is a common phrase in many obituary notices today, and a growing reality as cremation rates steadily increase in our province and throughout the world. More and more, families are waiting weeks, months and even years before interring their loved one’s remains. 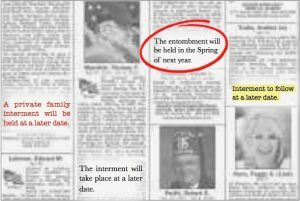 Some postpone the interment hoping to create a ‘more meaningful’ celebration, by waiting for a particular time of year, a date that holds special memory, or a month when the family might be able to gather. Others postpone because of indecision, financial issues, family disputes or a desire to keep the remains of the deceased nearby. From the griever’s perspective, keeping a loved one’s urn at home might be perceived as a means of comfort and a way to maintain the presence of the deceased. However, holding on to a loved ones’ remains, whether temporarily or indefinitely, often becomes an increased source of emptiness, as the remains are a constant reminder of the great sadness held inside. Ultimately, the distance between the funeral mass and the interment leaves the ritual celebration incomplete, and the bereaved in an awkward place spiritually and emotionally. We all struggle with saying goodbye, but it is through the act of letting go that we find peace and comfort. Transporting a loved one’s cremated remains to the cemetery or columbarium serves as a bridge between the rituals celebrated in the church and the Rite of Committal, now celebrated in the cemetery. Our Catholic faith teaches us that “life is changed, not ended’, when death occurs. Relinquishing a loved one’s mortal remains to their final resting place is an expression of our Christian hope and consolation, a proclamation of our belief in the Resurrection of Jesus. Although we have physically lost our loved one, he or she is still very much present to us, and letting go of our attachment to the person’s physical remains enables us to reach through the sadness of our loss to a new level of relationship with the deceased. While it graphically marks the end of the human relationship now severed by death, the Rite of Committal blends the realities of grieving and saying farewell into one integral act of faith. When the committal is celebrated in a timely manner after the Mass of Christian Burial, it serves as a meaningful continuation of the funeral liturgy. It not only celebrates the passage of a loved one from their earthly pilgrimage to Eternity, but also strengthens the faith of those left behind. of strength and comfort, as we long to be reunited with our loved ones in Heaven.